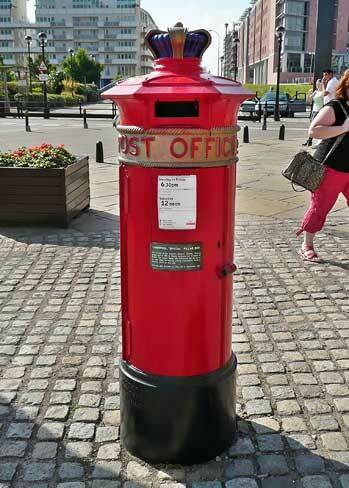 Last year, my wife and her lifelong friend made a long awaited trip to Liverpool. They had both achieved an age milestone and decided to celebrate by re-living their youth and visiting the one time home of The Beatles. This is my wife's photographic record of their memorable weekend, they found the city and dockland amazing and were lucky to have beautiful weather. 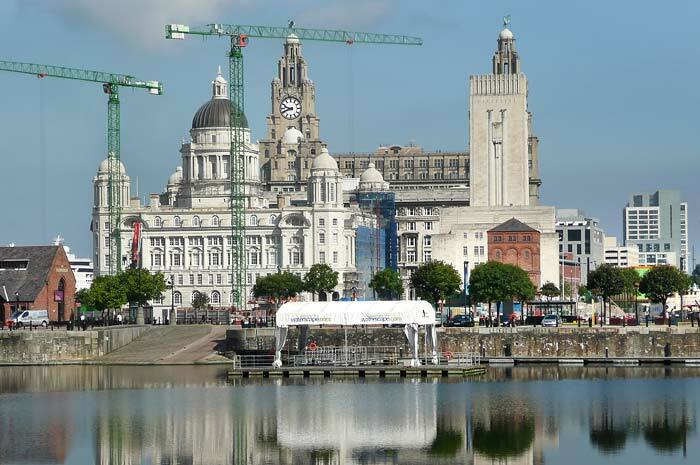 Surrounded by cranes The Liver Building stands proud against the skyline of Liverpool and its riverfront. The building was designed in 1908 by Walter A Thomas and completed in 1911 for the Royal Liver Friendly Society. When it was completed it was Britain's first skyscraper and built using a revolutionary steel and concrete structure. It features a pair of clock towers each 25 feet in diameter and larger than the clocks in London's Big Ben, they were built to give mariners the local time and are said to be accurate to within thirty seconds a year. In 1953 electronic chimes were installed to serve as a memorial to the members of the Royal Liver Friendly Society who died during the two World Wars. 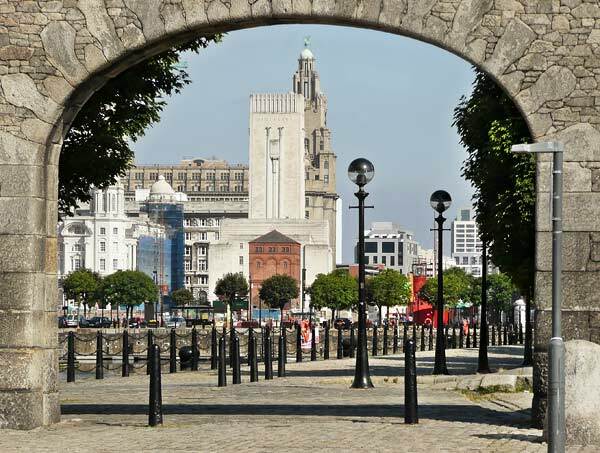 The Liver Bird is the official mascot of Liverpool and a cross between an eagle and a cormorant and stand on the top of each clock tower. 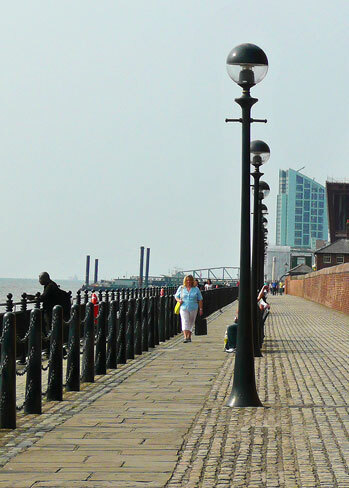 The domed building is the former offices of the Mersey Docks and Harbour Board. 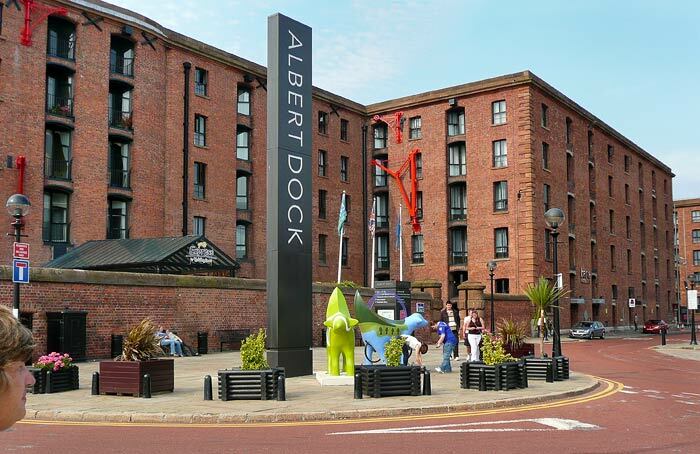 The entrance to The Albert Dock was opened by Prince Albert in 1846, and was the first in Liverpool to be designed with warehouses, and used the latest hydraulic machinery to ease the unloading of goods arriving from around the world. 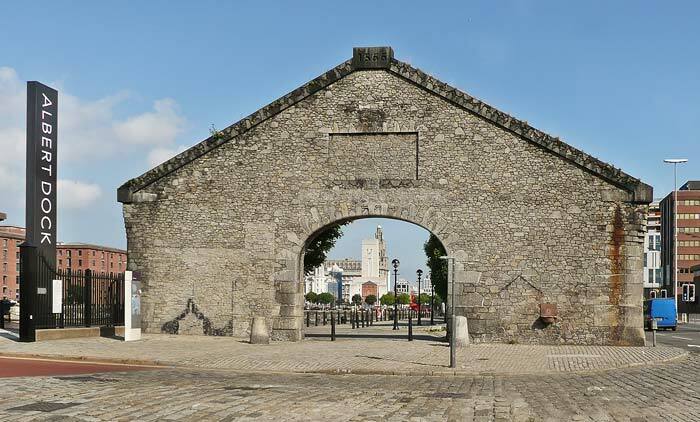 The dock covered about seven and a half acres, and cost �1,756 to build (about � million today) and could handle sailing ships of between 500-1000 ton cargo capacity. Some of the old warehouses that have been turned into modern apartments. 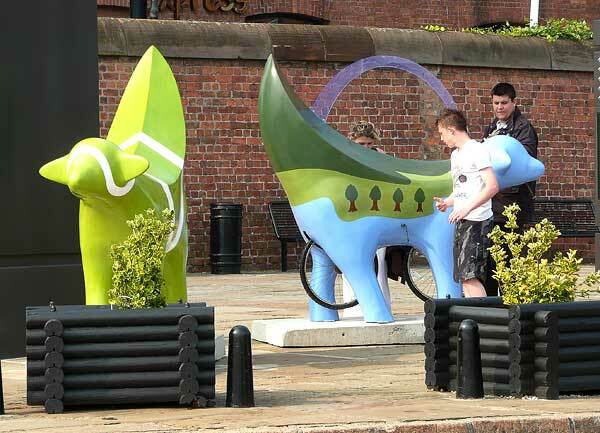 These are lambananas which occur all over the city. I've not been able to find out why a lamb and banana were chosen, whose idea it was, or what they represent. If anyone knows the answer I'd love to know. Diverse architecture for a diverse city. Another lambanana guarding the sculpture known as Liverpool's Case History. 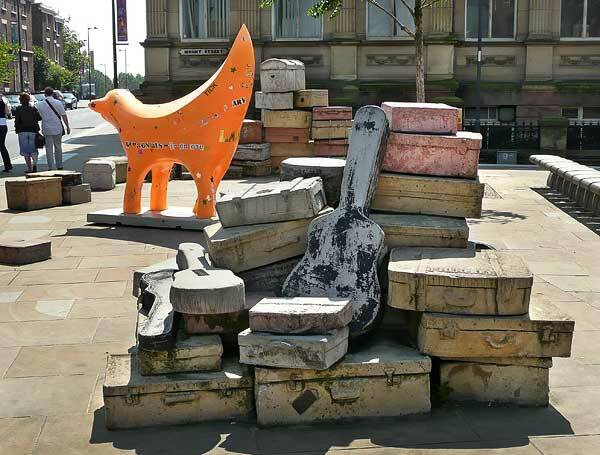 The Hope Street 'Suitcases' were created and installed by John King in 1998 at its junction with Mount Street near the Liverpool Institute of Performing Arts and Liverpool School of Art. The sculpture was commissioned by LIPA with funding from the National Lottery. The labelled suitcases "belong" to many of the Hope Street area's most illustrious names and organisations, including The Beatles, Sir Malcolm Sargent, Charles Dickens and Arthur Askey to name a very few. Liverpool Echo Arena and BT Convention centre part of the Kings Waterfront redevelopment. 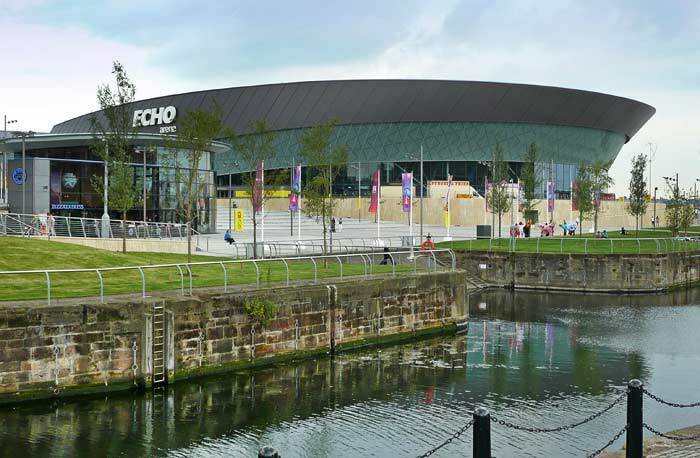 The building cost �6 million and provides an arena with 9,500 seats, a convention centre with 1,350 seats and 7,000 square metres of exhibition space. 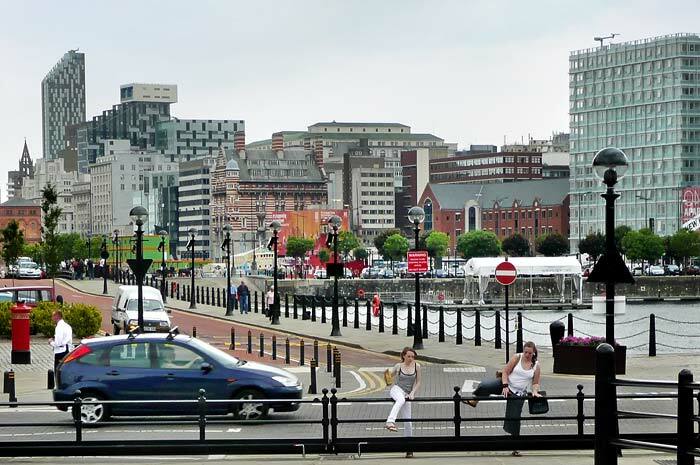 The complex was the first phase of the regeneration of this area of waterfront and opened in early 2008. 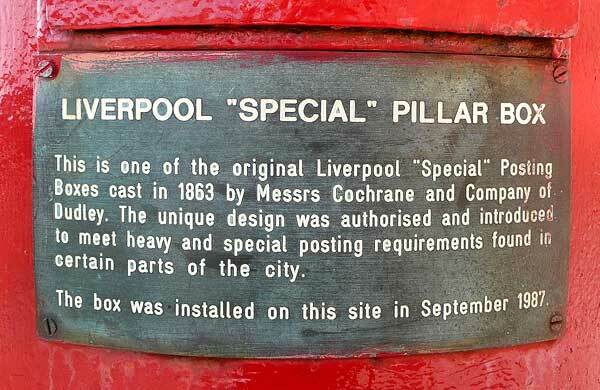 Another picture of the Albert Dock and a "Special" Pillar Box. 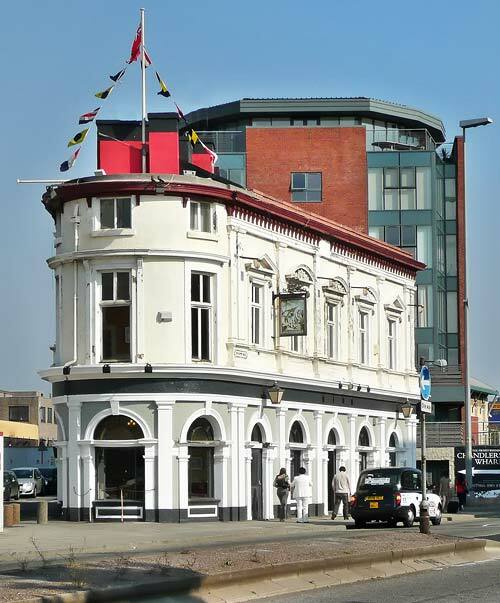 Opposite the waterfront the Baltic Fleet public house is the oldest pub in Liverpool's dockland. Built in the 1840s, the Grade II listed building is one of the few structures in the area to survive the enemy bombing of the Second World War. In the cellars of the Baltic Fleet is an award winning microbrewery which produces Wapping Ale, they also honour ships of the British Fleet with their own special ale when they arrive in Liverpool. A brew was also provided for HRH Duke of Edinburgh when he visited the city in 2008. 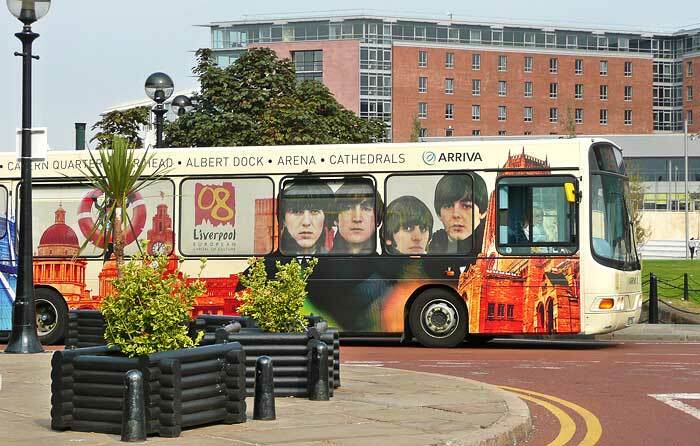 As if any reminder was needed that the Beatles were Liverpudlians.